Stamping Ground: How do you make the cut? How do you make the cut? This week's WOYWW featured several Deskers and their die cutters, new dies, or something die cut related. I've been thinking about it since. Don't worry, I find it soothing. I have a Big Shot, and it is within reach of my desk, as are the dies. I could almost brag that I have a die cutting station, after all, it is a specific area of surface dedicated to storing and using dies. But I don't think that real stations become covered in loose piles of other stuff, books, post and other detritus that spills over from my desk surface. No sir; people who have specific areas keep them specific. I've seen evidence - this is the WOYWW HQ remember. You know and can just see on the shelf that I'm a Scan'N'Cut owner too. Am finally turning to that more often, particularly for multiples or large images. But I can't see me getting rid of the Big Shot, which was the route I thought I was taking when I splurged on the Scan'N'Cut. See, I'm a 'one off' cutter. You may call it spontaneous, because that's more arty isn't it! Whilst I'm making a card or putting a LO together, it occurs to me that I need a frame, phrase or embellishment that I already have on a die. So I cut one. Often I have to cut another (and another) whist I try card colour and possible chop things about to overlap, under fill..whatever. My point is that I cut, use, put away (sometimes) and move on. 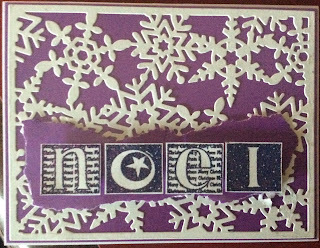 Here's a nice framed snowflake die in use. I love it. Had it for two years and we used it at the Card Marathon last week. It did cause me a lot of cutting time, but I didn't cut any extras. It hadn't occurred to me to have a session of die cutting to put die images into stock for later use. Turns out, others more organised than I, actually do this. So this possibly means that they use white card and colour it with inks and whatevers when they need to use it to match or stand out. Which possibly means that they have a good storage facility that keeps them flat and clean and above all accessible. Impressive. It also means, very much more impressively, that these crafty types often know what they're doing before they start. So perhaps they spend a day cutting Christmas shapes because over the next week, they plan to make Christmas cards. Wow. I can't do it. My plans are erm, too flexible for that. Even little dies are useful. But ergh, so fiddly! And there's something in my head that says that spending a chunk of crafting time 'just' die cutting isn't a good enough use of the time. Which is preposterous and ridiculous isn't it. Look back at my WOYWW post this week....'good use of time'? Argh. This Leopard cannot change her spots, but I shall be trying some gentle over cutting...from now on, each time I use a die, I'm going to cut a spare and see if I can remember where I've put them and if I ever get around to using them. It's not a life changing method, I don't think. But if it iturns out to be just that, you'll hear about it, believe me! I think having the space really is the key factor for me and if I can remember I will show where I now keep my die cutter(s) next woyww. Like stamping I can not do this just once, I have a ritual that this has to be done at least 3 times <<< am I crazy or is my brain thinking one for the base one to layer one just incase I lose any of the above..! The idea behind the scan and cut looks and sounds like a dream but my brain is thinking of the process you have to go through to get to that cutting stage. Wishing you a super weekend Julia & go girl with those Christmas cards. My shop-aholic friend Kathy loaned me her alphabet dies and cutter last year. I had three days to cut as many alphas I could in that time. I bought a package of legal sized envelopes and labeled them on BOTH sides with the alpha name. Then I found an old rectangular tupper type container and after each letter was cut the number of times to my satisfaction, I placed the envelope in the container. Since they are all together, there's no way I'm going to lose them. Not sure this will help you, but it's a thought. Hi Julia, I tend to forget about my Cuttlebug, as it is in one of the sideboards. 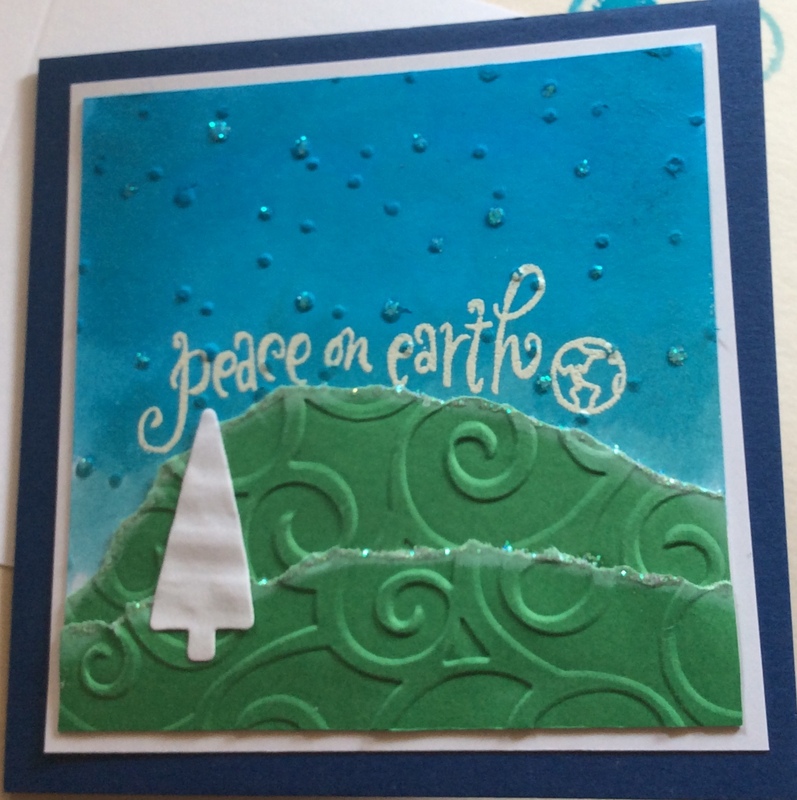 So when I do get it out, I usually do more than I need, whether that's die cutting or embossing. Then I keep the extras in a basket and root through them when I make a new card. I occasionally die cut spares... did it last year with some Christmas greetings (a Tim set) AND I even know where they are... in a little business card type plastic box (no "type" about it, I re-purposed it from work) - right next to my craft mat-on-the-floor.. indeed, in some wider shots some weeks it may even be visible. I often mean to do a stock pile of other images too... it'll happen one day. possibly. You had me with the idea of a station for all the cutting things... I almost fell off my chair laughing at the 'know what they are doing before they start" crack! I will admit that my um areas for cutting spill onto any open table space. Put in an extra table? Just set something else up on it and fill it to the max. Sometimes I will cut several of the same thing in different shades or paper type. Some of them I use, some of them I gift out. Others I meticulously store...Not so much. Usually they disappear into the table top piles. Thanks for sharing you photos and your clever insight. Do NOT get rid of the Big Shot, Julia! I've made that mistake when I bought the Cameo and had to buy a Big Shot again. A manual and electronic cutter compliment each other and can not replace one another. 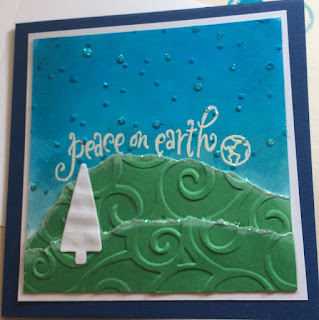 Just think of embossing! You can't do that on the Scan&Cut, can you? Also the manual cutters can do very intricate Doily-style designs. In my experience, at least the Cameo, struggles with very fine details and it can not cut foam or thicker materials. Also, when you want something immediately, it's so much easier to just run it through the Big Shot. As for organisation, I would be the wrong person to ask LOL! I like to scatter die-cuts all over my desk and just pick one when I need them. And yes, just ink them as needed. I tend to cut mine from kraft card or whatever I can find within easy reach, even scrap packaging. I do most of my die-cutting on the floor - on hands and knees (ouch!) - but I'm planning on buying a side-kick to keep on my desk for smaller cuts like letters and smaller elements. That will be my Christmas present! My die cutting is a 3-shelf cart I bought at a home improvement store. Bob put wheels on the bottom so I could pull it out to work on when needed. The Vagabond sits on the top shelf, my original cricut on the middle shelf and the larger cricut (explore I think) sits on the bottom shelf. I can fold up the vagabond and move it off the top and place which ever cricut I'm using on the top. I think a second copy when you have a die out anyway is a good way to start Julia. White card is also a more useful colour; as you say, it can then be coloured to match the next project. I tend to stick my extra die cuts to one side and grab them if I am stuck for inspiration on a card, or send them as extras when taking part in a swap. I am not as organised as Shaz though lol. Lolling at this! Especially the 'I rest my case' directly under the picture of where everything gets put on top of the BS! Wow, I have the noel stamp too, never seen it anywhere else before. You and I are in same camp... all way through your totally logical post my head was nodding in agreement or rocking with laughter while nodding!! Rarely know where I'm going .. never cut en masse or stamp a lot. Do stamp few extra as do mess often in cutting or arrangement. I have a cutting station littered with multiple detritus! Sending bloggy hugs across the miles.